Thanks to their squished little noses, pugs have some respiratory issues that can be enhanced in the high altitudes of an airplane. This doesn’t mean your pug can never travel with you by plane, it just means that you need to know the steps to take care of your pug on flights in order to ensure you and your pug have a safe and comfortable trip. Check your airline's specific regulations for traveling with your pug. Most airlines require a health clearance certificate that states that your pug is healthy enough for air travel. Also, check with the airline on the required measurements of your pug’s carrier, especially if you want it to fly in the cabin with you. Take your pug to the veterinarian a week before travel in order to get a health certificate and ensure it is stable enough for travel. 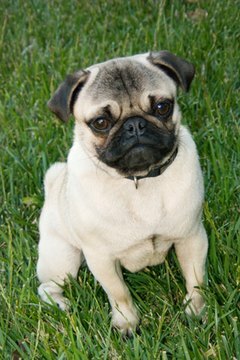 Each pug is different, so your veterinarian may advise you against traveling by plane with your pug or give you specific instructions pertaining to your individual pug’s health. Purchase a traveling crate at least two weeks prior to the flight that fits your airline’s guidelines. You want a hard crate that gives your pug enough room to stand and shift around a little. Find the right size for in-cabin flying to ensure the crate is small enough to fit under your cabin seat. Place a foam lining with a blanket in the bottom of the crate to give your pug some soft support in its crate and ensure your pug has a less bumpy trip. Use a blanket from your pug’s home bedding, as the familiar smell will be comforting to it. Have your pug sleep in its travel crate before making your trip so that it is used to the crate. Place your pug in the crate every few days for at least a couple of hours during the two weeks prior to your flight. Stay relaxed and calm with your pug the day of the flight. Feed your pug an hour before leaving for the airport. Talk in a soothing voice when it is time to put your pug in the crate to head to the airport, and place it in the carrier with one of its toys. Check your pug in with the required health certificates and documentation, and walk your pug and let it relieve itself about 15 minutes prior to takeoff. If your pug is flying in-cabin with you, place it in its carrier under the seat once on the plane. Lean down every now and then and say something to your pug in a calm voice so that it knows you are there during the flight. To get your pug used to its travel crate, one idea is to take it for a trip in the car a few times a week inside the crate for the two weeks preceding the trip. Another idea to keep your pug calm is to throw an article of clothing of yours into its crate before travel, so that it has your scent there to calm it down. Never sedate a pug for travel, unless your veterinarian okays it. Pugs are notorious for having breathing issues, and sedation can further complicate these issues. Mixed with the high altitude, sedation can be very dangerous for your pug’s breathing.